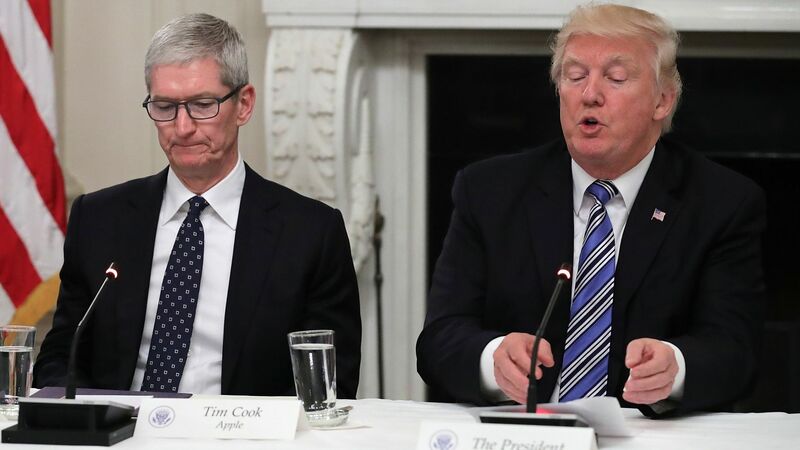 Apple CEO Tim Cook is set to meet later today with President Trump, and tariff concerns are on top of his list of concerns. The bottom line: When Trump decided to pick a trade war with China, he sent shivers through Silicon Valley. Talking down Trump is high on the list of many tech leaders — not just Cook. The context: As the CEO of the world's most valuable company, Cook already has a strong voice. In this case, though, he's also speaking for the rest of the industry. Trump's trade war has been a huge business concern — and magnified by the fact the Trump administration gave just 60 days notice regarding which products would be subject to the new tariffs. "That's a tough way to run things," one executive at a large multinational electronics company told Axios. The executive said when the list of affected products was released, it was kind of like a group of college students scrambling to read a printout on the wall to figure out if they had passed or failed a test. "Oh good, phones aren't on the list," he said of his initial reaction. However, other things his company makes, like TVs and some appliances are on the list. Short notice: If there had been a year's warning, companies could have come up with some alternate options, but 60 days provided no way to change production plans. That makes lobbying Trump to change course even more important. The big picture: Cook is also looking to feel out the president more broadly when it comes to economic policy. The Apple chief had a close relationship with former economic adviser Gary Cohn, and the two were frequently spotted dining together when Cook was in D.C. Where things stand between Cook and new economic adviser Larry Kudlow is less clear. Coming to dinner: Cook and Apple VP (and former EPA administrator) Lisa Jackson were among those at last night's White House state dinner. Also on the guest list, per CNN, were IBM chief Ginni Rometty and Lockheed Martin CEO Marillyn Hewson.